Let the sick be nourished, the hungry be fed, the aged be protected and the homeless be sheltered and our people and infants be cared for. 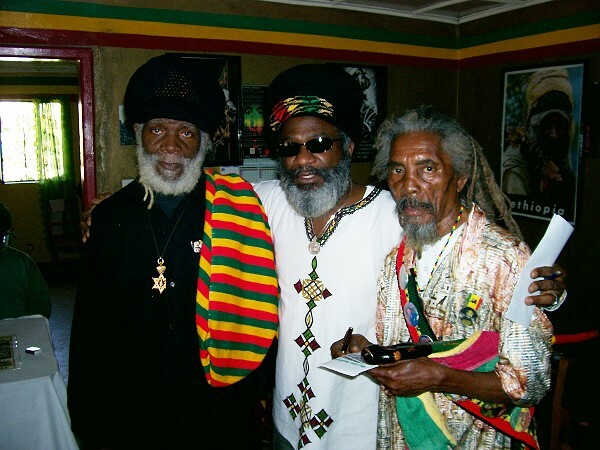 This message is to bring to the attention of Rastafari people, and the entire African world, the recent passing of Bongo Rocky and other Senior Elders, like Bongo Pooru, Bongo Wato, Ras Derminite, Ras Pidow, Ras Historian, Ras Iyapert, Bongo Smithy, Bongo Iyarny, Ras Bigger and so many others, too many to be listed here. But the thing is, there are some lessons to be learned from the passing of all these African liberators, who have spent their lives, agitating for the liberation and Repatriation of African people everywhere. It is very important for us all as a race of people, to learn that each of us was placed here upon this earth, to do a certain amount of work, and as soon as each of us work is finished, we just have to move on and get out of the way, and leave space for the following generation, to carry on the work which must be done. All of the names of these elders who are listed here are African patriots, who have worked very hard in their struggle, for the liberation and Repatriation for their African people everywhere. They were also great in their cultivation of many oceans of self-determination, which they shared with their people, including the following generations. Bongo Rocky was a very remarkable Iyagel as it relates to sharing good information, relating to the liberation of the minds of African people from mental slavery, as well as pushing for Repatriation, Reparation, Restoration and Compensation for Mama Africa and her people, who were brutalized from Mama Africa across the middle passage, to the slave plantations of the western hemisphere, and finally abandoned in the lands of captivity, for the past more than five hundred years. I have known Bongo Rocky since the year 1956, when I went to the Valley of Abaca (Back o Wall ) to see my brother and to my historic greatest pleasure, there was my brother Ras Peter the Great, Bongo Rocky, Bongo Slim, Bongo Granville, Ras John and other Iyathren, giving thanks and praises to the most high powers in this universe and breaking bread together as a race of people. I was very impressed with the peace and love which were displayed there, and there was also the reading of the Bible with interpretation, as well as the reciting of various Psalms aloud together. I did find it a very good and peaceful place of learning and from then on that was where I spent my younger years studying. As the days, months and years went by, I was able to learn much from Bongo Rocky who became a great street teacher; that is to say, he walked the streets of the City of Kingston Jamaica, well-dressed in his African attire including his Red, Gold, Green and Black colors, which made him quite attractive for conversation, in a country where the inhabitants are mostly Black but were considered to be British subjects as a result of British colonialism. The conversations could start as simple as, "Why are you wearing all those ugly colors, or why are you keeping all those long hair upon your head?" Then Bongo Rocky would respond, "Open your eyes and your mind, these are your own beautiful African colors and the hair upon my head is my sheep coat like Sampson, and I am very happy with my self as a African person." Then the person may say, "You are a Jamaican; you are not no African and you should go and comb your head. You need to have some ambition," and that kind of start could cause a big reasoning, and some times other people would pass by and become a part of the reasoning, and before long there would be a gathering - some agreeing with Bongo Rocky and others opposing; it all depends on the place and time of the day. So, the above approach gave Bongo Rocky a chance to teach his people; some of them became convinced and became students of Bongo Rocky over the years, while some remain his critics. But for many years he remained a street teacher and became widely known throughout the city of Kingston and other parts of the Island of Jamaica. As time went by, life caused us to have our tabernacles beside each other with what can be described as reasoning chambers, with benches for Iyathren to sit and read the ible and other books and reason about them together, and take a good look at the dirty behavior of babywrong. There were also times when the city became too noisy and we would travel to a place called Mount Airy in St. Andrews, to visit Bongo Ackee and Bongo Grey beard in Mount of Olives, where we would assemble and reason about the state of our race and the downpression of babywrong upon our people. There is so much more information to be shared about the great works of Bongo Rocky and other elders, which will be better shared in Assembles of reasonings, since pen and paper are not qualified to contain it all, and to continue to write these many oceans of memories which is flowing from the pages of our memories, can become very tiresome. But now I would just like to say, that Bongo Rocky has done his portion of the work as an African Liberator and patriot and that his works, spirits and good attitudes should long be remembered in the Assemblies of our people, and should be passed on to our children and their children as the wheels of life keep on turning. It is also not important to be telling others how a person passed away, what is really important is to tell people about the good works which were done by that person, when he or she was alive. I will try my best to share some more memories in another post as soon as it is possible. Take the best care of your people. Again, I send many oceans of blessings and self-determination to African people everywhere.